I’m really excited to be sharing with you my brand new and very first, leather jacket. I’ve been tempted by real leather jackets for a long time and after having numerous faux options and lots of leather boots and bags, I decided that I thought I could make the jump to a real leather jacket. I wasn’t sure at first, but after seeing this gorgeous All Saints Papin jacket that I had been staring at for months, I finally decided to try it when they had 20% off a while ago. I’m really glad I did as well, so I thought I would review it for you since it’s a very popular jacket. The Sizing: I ended up taking size UK 4 which is the same size as the jersey Kit biker I had from All Saints, however my usual size with them is UK 6. This jacket is designed to be worn oversized though as you can wear knitwear underneath it, but I found having a larger size actually made me look quite bulky since the sleeves are padded. That’s why I decided to go with the smaller size and wait for it to stretch a bit. I can wear it comfortably with a light weight knit underneath, but that’s about it at the moment, until it stretches some more. If you want a tighter fit, then you should size down like I did, but if you want it looser and you can get away with that type of look, go with your normal size. The Fit: The fit on this one isn’t 100% perfect for me since the sleeves are quite cropped unfortunately. I have longer arms and usually I fit sleeves perfectly and since this one is cropped, they do fall at a bit of an awkward length on me, but if I wear knitwear underneath then it looks much better. I’m not sure this leather jacket works for bare arms though. Not on me anyway. I tried numerous larger sizes and the sleeves were still cropped so they are definitely designed that way. The shoulders fit me perfectly, the arms are quite tight, but they will stretch and I can’t really do it up at the moment as I have quite an awkward shape. My shoulders are smaller so I often need to size down to get jackets to fit them and that means I can’t often do jackets up. I’m not too bothered though because I think leather biker jackets look best worn open. With all that said, I do still love everything on it, especially the design. The Design/Style: When it comes to leather jackets, I’m quite particular on the designs and styles I like. They have to have quilting, zips, lapels that stay flat and a nipped in waist from the back. I’m not a huge fan of the belt that usually goes around the entire bottom of leather jackets and I’m thankful that this Papin leather jacket doesn’t have one, only two little ones. Everything about the design and style of this jacket is perfect to me. I love the collar, the sleeves, the zips on the sleeves and on the body of the jacket as well as every other detail and it nips in perfectly from the back, so you can still see your feminine shape. As far as biker jackets go, this one is definitely beautiful. Styling it is easy as it goes with everything from cute black ankle boots and skinny jeans to layering it over a floral dress. 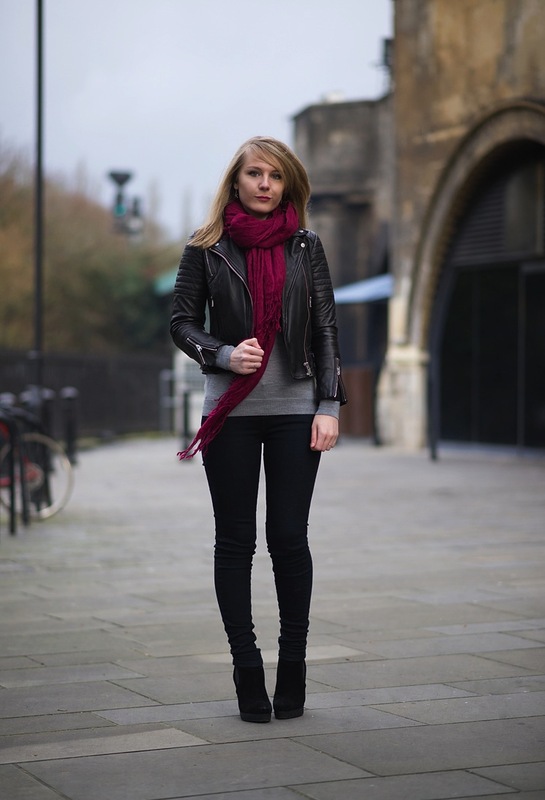 My favourite way to wear it at the moment though is with burgundy knitwear and grey skinny jeans, with heels or boots. I love it worn like this and I can’t wait to show it to you in January in an outfit post. 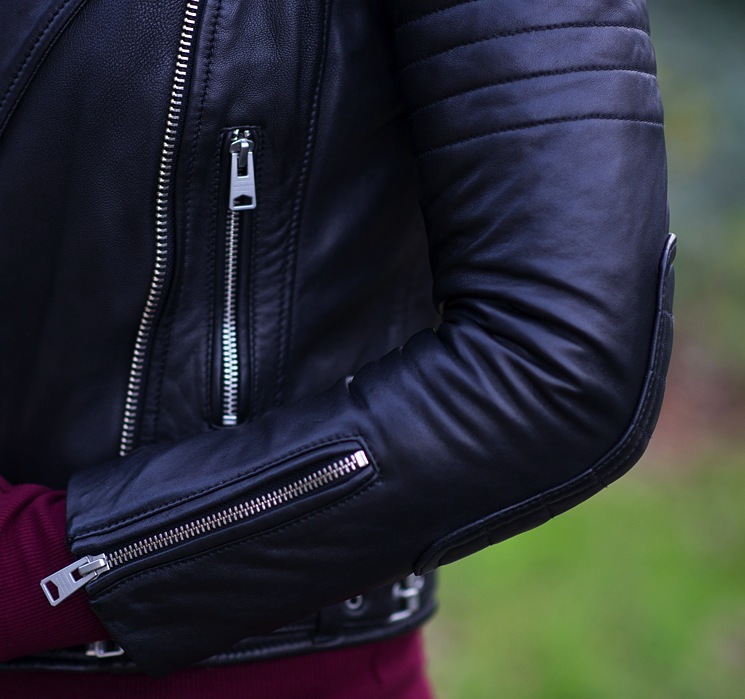 The Comfort/Leather: As I’m very much used to faux leather jackets, I’ve not really experienced the comfort and ease of a real one, so I was quite surprised to find out just how stretchy and soft this jacket was to wear. I can move my arms a lot more freely in this one than I can any of my others and the leather doesn’t squeak either, which is a bonus. It’s very soft, supple and delicate which allows it to fit me nicely. The arms are a little tight at the moment but given how stretchy it is, I know they will mould to me perfectly soon. It’s a pure black shade of leather too, so I can only imagine how nicely it will fade a bit in the creases as it gets older and has more wear. The Overall Opinion: So overall, I absolutely love it! 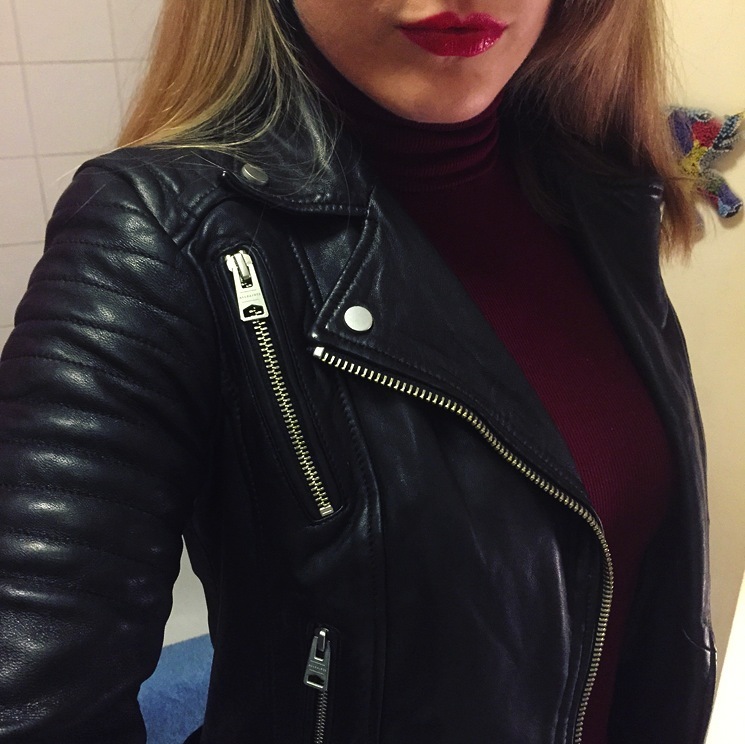 I would like it to be less cropped in the arms though so it could be worn without knitwear underneath, but it’s definitely got me liking leather jackets a lot lately. 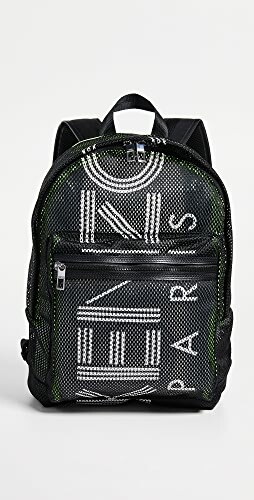 I’m always checking out the new ones and I can see this one being really durable and long lasting, despite the delicate and soft leather. I’m sure you will see it on me often next year, that’s for sure! 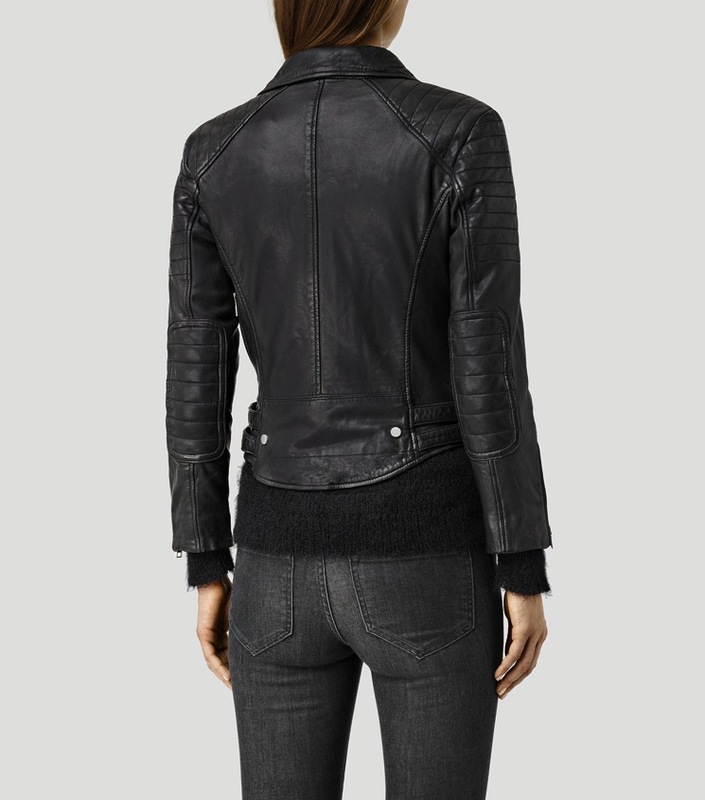 What do you think of the All Saints Papin leather jacket? I’d love to hear your thoughts and if you have one! 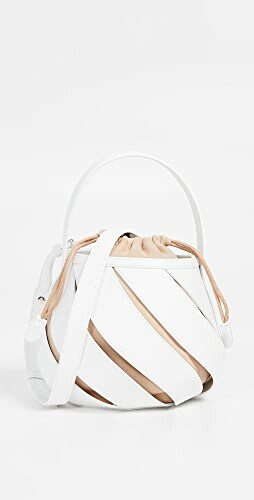 I know fashion blogger, Marianna has this exact one and looks amazing in it. That is one beautiful leather jacket! Thank you very much! I wish you a very happy Christmas too! It is a lovely leather jacket! I agree the cropped sleeves are great for layering underneath it but I’m not sure how great it would look without that. Great that you scored it on sale too! All my leather jackets have been sale bargains that have lasted me years and are still going strong! Pleather does not work well in the humidity here! Yeah the pleather doesn’t work for me either as it makes me sweaty and sticky, so I totally get that. Really glad you like it! 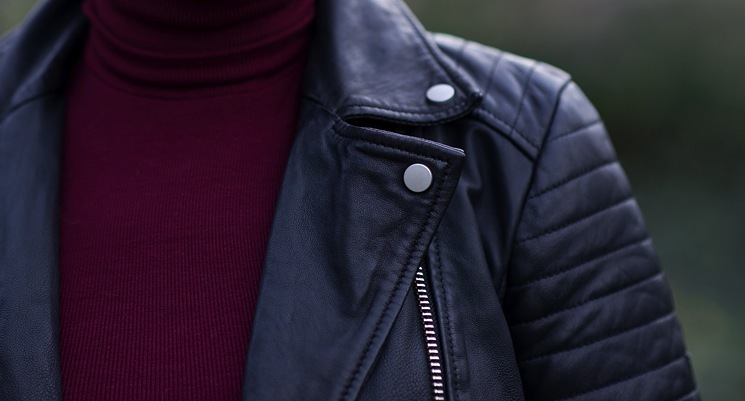 What leather jackets do you have? Such an edgy chic jacket. Love the details on it. Thank you! I guess you could call it that, I ended up with 4 presents for myself during the Black Friday sales time, so I think they constitute as an early Christmas gift, ha ha! 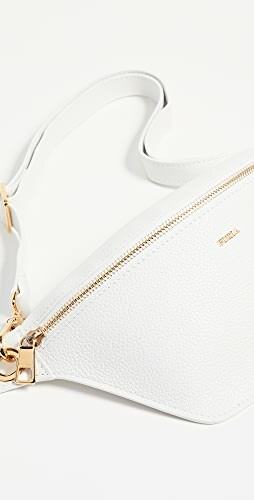 I got way too much, but you can’t pass up your dream items when they are on sale can you? I still think a Dr. Who Tardis case is in order! That’s really amazing, dear Lorna! A real leather jacket for the first time, it’s very nice, well done! I mean, yes, the quality is different from faux ones, and you will have it for many years. It looks perfect! I am eager to see the many ways you can style it! I would like to wish you now a beautiful Christmas with joy and fun and eager to see your looks and read your stories in the new year too! It was great to get in touch this year! Thank you so much Denise! So glad you like it and I wish you a very happy Christmas too! It’s been lovely getting to know you this year too! You look very foxy Lorna! The jacket looks fabulous on you and definitely has the wow factor! It looks stunning on. Great jacket. 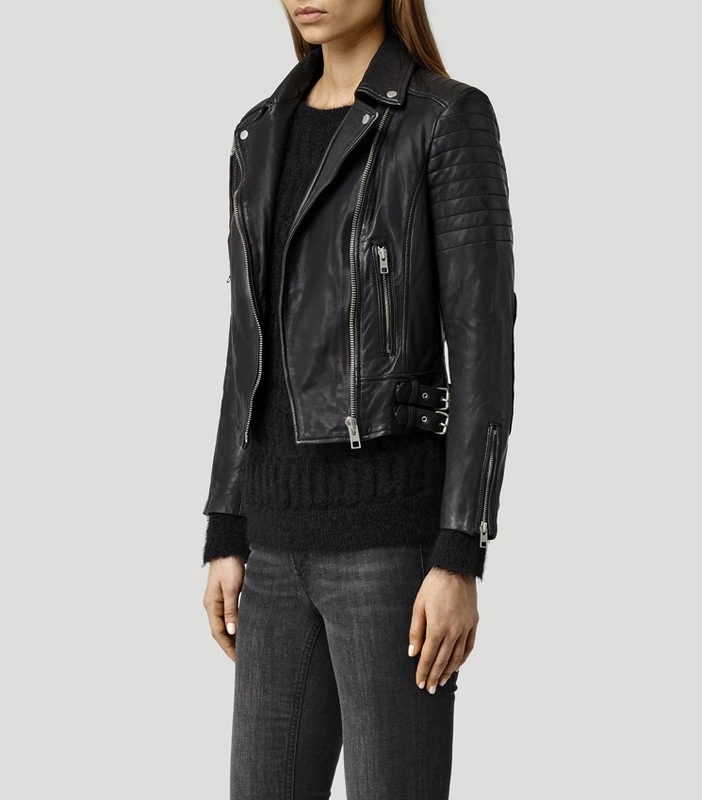 I’ve just read your review on the All Saints black leather Papin biker jacket as I’m considering buying one online (I live in Jersey and we don’t have a branch of All Saints there, hence I have to order online without being able to try it on first). Firstly, may I say that you look great in it! It seems to fit you perfectly, and what I was wondering is how tall you are as I’m quite short (5’4″), a size 10/12 with quite broad shoulders and back but a fairly slim waist (for my age – I am 53 after all! Maybe I shouldn’t even be wearing a leather biker jacket at my age?!). I’m worried that the waistline of the jacket might be too low on me, especially at the back where the jacket is quite fitted. I’ve tried on so many leather jackets now and the waist always seems to sit too low, i.e. just below the top of my hips rather than on my waist or just below, and they look awful on me especially when I try to zip them up (although as you said in your review, I probably wouldn’t have it done up most of the time to be fair). The bottom of the jacket always ends up looking strained and too tight – not a good look! Also, would you say that the jacket is true to size? I’d probably order the 12 as I think the 10 would be too narrow for my shoulders, but if the jacket runs small then I might even have to go up to a 14, although I’d be concerned then that it would be too bulky around the middle. I’d be really grateful if you could find the time to reply to me with any advice you can offer as it’s a lot of money for me to spend on an item that I’m buying without even having tried it on! I think you can wear a leather jacket at any age as long as you style it right! It definitely doesn’t run true to size, I found it to run quite big compared to All Saints other things. Have you tried All Saints before and know your size in them or are you basing the sizing off of other brands? I’m asking as All Saints runs big compared to most brands. I’m 5ft4 – 5ft 5, sort of in the middle of both heights, but a UK 6-8 and took this one in a UK 4. I don’t think the height matters so much as the length of your torso which might be the issue. Some people have shorter or longer torsos, mine is pretty long for my height in ratio to my legs, so things are often shorter on me. This one is designed to hit around the waist and top of the hips, but without knowing if you have a shorter or longer torso I can’t say how it might fit in terms of length. Sorry! Like I mentioned though, I find leather jackets look best worn undone, when you do them up it creates a stuffy appearance and makes everyone look bulky, even the slimmest of people, so I never do it. 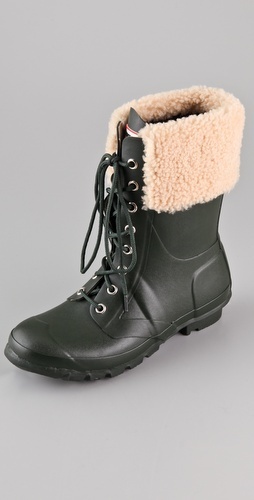 The leather is really soft and supple though, very stretchy and it gives a lot. But let me know about your sizing and I will see if I can help. Thanks! To answer your questions, no I haven’t actually tried on any All Saints clothes before, as unfortunately we don’t have a branch here in Jersey where I live. Other brands of leather jackets I’ve tried on so far have all seemed very tight across my shoulders (which are quite broad), and they’ve all been slightly long on me because my torso is quite short (well, the rest of me is quite short as well to be honest!). I think you’re right about not trying to wear the jacket zipped up so I don’t think I’ll worry too much about that aspect – I’m glad you said that most people don’t look that great with their jacket done up as I thought it was just me! I think on balance I should probably order a size 12 (which is my normal jacket size) because of my shoulders, and the fact that you say the leather is so soft and supple, you never know I might actually be able to do it up once I’ve worn it for a while! Thanks so much again for your help – I’ll let you know if and when I buy this jacket! Just need to pluck up the courage now to spend all that money on one item of clothing eek! You are very welcome! I always try to reply to everyone who leaves me a comment as my readers mean a lot to me, so feel free to ask anything! If you decide to buy the jacket, do you think you could buy it through my blog by clicking the All Saints link in this article? That way they know that you went to their website via mine 😀 That would be a huge help! All Saints do generally run bigger than most brands, so hopefully the 12 is just fine for you. If it’s slightly loose then it’s easily fixed by wearing it with a thicker top underneath. Good luck, Mary! Thanks again for your fab replies and all your help! I’m really happy for you that it worked out 🙂 You should email me a photo if you want to share it, love to see how you style it! And you are very welcome! I would if I knew how – I’ve only just managed to work out how to get your replies to arrive straight into my email inbox, rather than me having to read them via your website! Sorry Lorna, I’m a completely technophobe and posting a photo would be like flying to the moon and back for me! However, just to answer your question, I’m intending to wear my jacket with EVERYTHING! But mostly with knee-length floral dresses, thick tights and chunky boots (I don’t really do heels anymore – did those in the 1980s and my feet just say a big loud ‘NO!’ to those now). No worries! I understand! I’m just glad it worked out for you and you have a great new jacket! No worries at all 🙂 Glad it fits! I’m not sure how the size 2 fits as I haven’t tried them, but I do know that the same size jackets fit differently. I’ve tried 3 size 4’s on my Randall jacket and they are all different tightness. So a 2 could fit the same as your 4, and a 4 could fit like a 2. It’s a nightmare with their handmade jackets lol. Mine stretched a bit, but I would probably say don’t buy it super, super tight. Mine is really tight but because it’s that tight, I have barely worn it because it’s not very comfortable. If you know what I mean? Hi I’ve recently bought this jacket …. I love the style … however I’m finding the length of the arms a little short, wondering after some wear & a little stretch in the leather, whether this will feel better? Unsure do I keep or return….. not sure if it look like it’s too small having cropped arms. 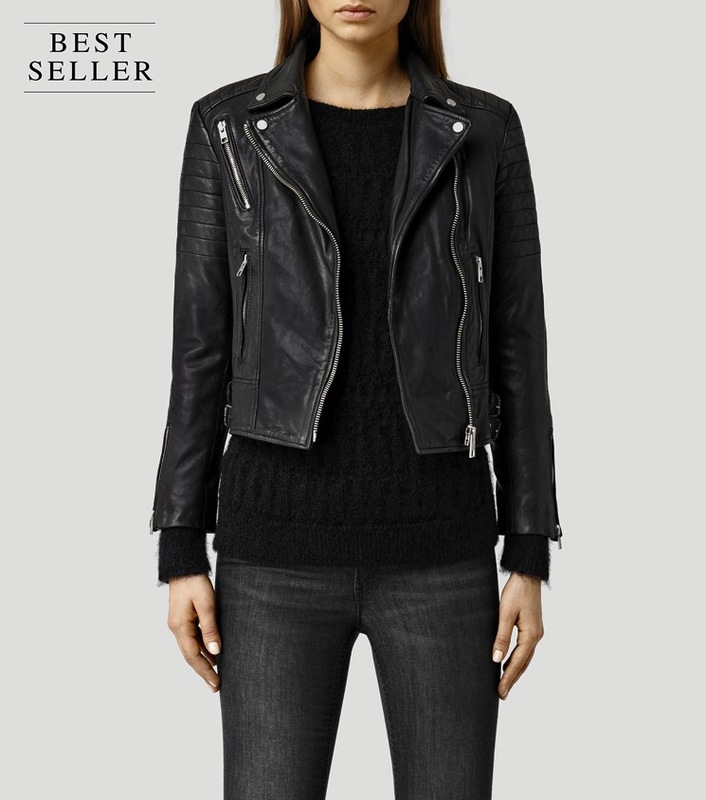 Hi,u look amazing with this leather jacket,I want to buy one online,n unfortunately only size two left,I am 5f4(166CM)n weight 49KG,well,my usual size6,anyway different brand n size could be different,in topshop my size 6,river island my size become 8,so I never try allsaints brand before,shall buy size 2 in this jacket? Hi Kimberley, is this UK sizes you’re referring to? 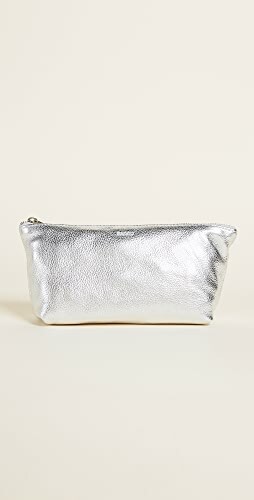 In Topshop I am a 6-8 and in River Island a 6-8, but I took this Allsaints Papin in size 4. It runs quite big, so you can definitely size down a size. Perhaps a UK 4? 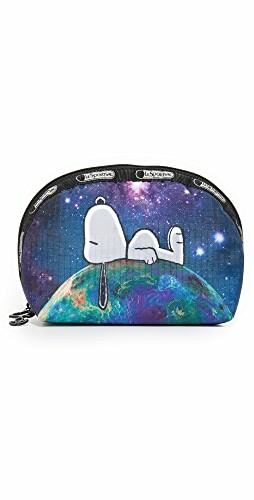 Do they have that one in stock? Depends if you want it really tight or if you want to fit sweaters underneath etc. Hi, do you have a normal Allsaints size? 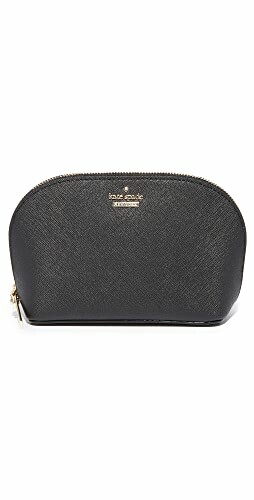 Is the UK 6 your Allsaints size? Hi – no, I’m based in New Zealand and we don’t have any AllSaints stores here so I’m unsure of my AllSaints size. I’m usually a UK6 in jackets (eg. Theory/Topshop) and a UK8 in tops/shirts, though. 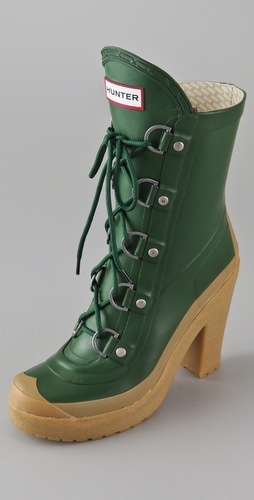 Shop Wedge Pumps Shoes, Pink Flat Shoes, Heel Booties, Workout Leggings and more. Get this widget.